Fleas are very common, and often carried by a range of domestic pets at some stage during their lifetimes. Adult fleas are parasites and live off warm-blooded animals. Different species of flea live off different animals. Most of the common domestic pets, such as cats or dogs, are at risk from fleas. This is especially the case in the summer months and in warm environments such as centrally heated households. As fleas can remain active all year round, it is important to have an understanding of the flea life-cycle and the problems caused by fleas. They range from 1-8mm long and are normally brownish in colour. Flea eggs are approximately half a mm long, pearly white in colour, and laid on a pet or in your pets bedding. 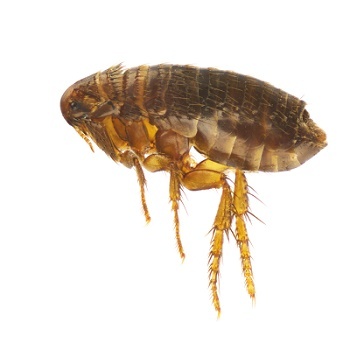 You will probably be alerted to the existence of fleas as your pet may constantly scratch itself, or you may develop skin irritations or reactions to bites. The existence of fleas can be confirmed by the identification of flea droppings, which are small and black in colour. These normally contain dried blood, and are often found in clusters next to the skin. If you do have a pet, they are easily spotted in light haired animals by brushing back the hair. However, in dark coated animals it may be better to comb the animal over a sheet of paper onto which the flea droppings will then fall. To identify whether these black objects are in fact flea dropping, simply add a few drops of water to them. If they are flea droppings, they will turn red. Typically, adult female fleas will jump onto your pet while it is outside. These will then feed on your pet, and once in your home they will begin to lay eggs. Generally, these are laid in pet fur or bedding, but soon drop off into dwelling areas such as baskets or carpets. A female flea is capable of laying as many as 400-800 eggs, usually in batches of up to 20, during its lifetime (approximately 2 years). Depending on temperature, these eggs will usually hatch within 2-16 days. The emerging larvae are active, hiding from light and feeding on dust and flea droppings. It takes between 7-10 days for each larvae to fully develop. From this, the adult flea then takes another 10-17 days to develop, under average conditions. When the adult flea emerges, it will begin to actively seek a blood meal, and the lifecycle begins once again. In humans, fleabites can produce an allergic reaction. The typical symptoms to a flea bite are a small red spot 5mm or so in diameter. In sensitive individuals, the response can be worse and the bite intensity itchy. Any cats and dogs should be treated for fleas and with an animal insecticide recommended specifically for that purpose by your local Veterinary Surgery or pharmacy. Since fleas, at various stages of their development, can be found both on and off the animal, complete flea control should involve treating domestic pets and dwelling areas. All floors and upholstered furniture should be vacuumed to remove animal hair, organic debris, flea eggs and pupae. Particular attention should be given to the areas where pets have been allowed to roam and rest, such as under furniture, under chair and sofa cushions, cracks and crevices in floors and along walls. The vacuum bag will contain flea eggs and pupae so should be disposed of immediately in an outside waste bin. We offer a chargeable service of £79.00 (or £39.50 - a concession for certain benefits) to treat fleas. Book an appointment.